Being observant and being able to anticipate what will happen, and where it will happen, are key traits you want in a Saratoga NY photojournalist. You need someone who is good with people, who is personable. And you need someone who is technically proficient and able to work quickly and accurately. Someone who is a photojournalist needs to be comfortable working in all kinds of conditions, both indoors and outside. They need to be able to relate to all kids of different people under all kinds of different circumstances. And they need to be able to see what potential images any setting holds, then they need to be able to bring those image to life. The ultimate goal of a photojournalist is to create an image that communicates some sort of information, does it in a graphically pleasing way and also elicits some kind of emotional response from the viewer. That can range from “I didn’t know that!” to “I’ve seen and experienced that sort of thing myself”. Being able to have a photograph cover all three of those steps means that the photo will be successful in the viewer’s mind. And your message will be successfully communicated. For over two decades, I worked as a full time staff photographer at a newspaper. My job had me covering thousands and thousands of assignments. Of all sorts. In all seasons and all kinds of different conditions. Those years of working as a photojournalist gave me the experience and abilities to cover any kind of assignment for any type of publication. I learned how to work without disrupting the natural flow of an event, how to work without altering what was really going on. I learned to capture as opposed to directing an image into existence. I learned what the cliche images were and how to avoid them. The skill was developed which allowed me to quickly make a meaningful but relatively safe image from any situation quickly. Knowing I had that safe “keeper” image allowed me to move forward and dig into a situation more aggressively to find better and better images as I worked through it. Today those skills are invaluable for assignments where I’m not technically working as pure photojournalist but instead am working in a little more of a controlled situation such as photographing for a trade magazine. But those skills of finding images quickly and working easily with people, who are often busy, do transfer. And being able to find images quickly means that I can produce a lot of quality content from any shoot I’m hired to complete. Some background on this photo of a worker clearing a walkway after a snowstorm. I’m always attracted to graphic elements and repeating lines. And after a major snowstorm, I headed out early the next morning knowing that I would be assigned to create some photographs that showed the impacts of the weather. Of course there would be the usual images of traffic snarled. Of things closed down or of people digging out. And those images would be hard enough to make because I would be required to drive on those same snarled and unplowed roads. So I went out very early. I knew of a few areas where there were some nice graphic elements and repeating lines. Checking them out, some were already disturbed by post-storm wind. Others were a pretty graphic with all the snow, so I just made a pretty image and quickly moved on. But I always want a human element in my images. Or some trace of human activity. So I headed for another location that I knew and wow, the trees were full of snow and there it was! 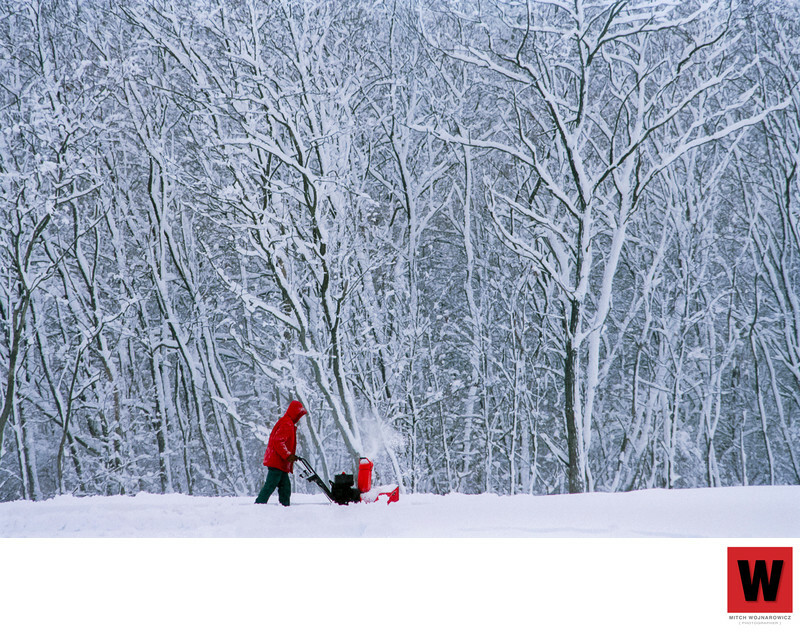 A custodian at a school working on clearing the walkways. I looked over the grounds and figured out that at some point in the process he would cross through this spot, in his all to perfect red jacket. I made some images of him working outside the school. We chatted for a couple minutes and I gothic name and a couple of lines of quotes from him about the storm. He knew I was there at that point and knew what I was doing. So from that point forward he just forgot about me and went about his business. I waited awhile, worked a couple of other angles. And then I moved into the spot I knew would make this great and graphic image. A few minutes later he walked, quickly, through the frame I had chosen in advance. I shot about 3 frames as he moved through and knew at that moment that I had my image. It ended up being the leading front page image for the storm coverage running 4 columns wide. A little bit of side info: Often the hardest park of working a fluid situation like covering the effects of a storm isn’t negotiating roads that are in poor condition. It’s finding a place to park! Roadways are narrower after a major storm because of what was plowed. There is no shoulder any more where a can can be left. Parking lots are often the last places to get plowed out. So you can’t park in them, or there are already a bunch of stuck cars or people digging out. So the real skill is in finding a place to park so you can get out of the car and make a photo. I’ll complete your assignment with no complications. You will get what you were promised. It will be done on time. Everything will happen within the budget we agree to. All of the billing paperwork will be done effortlessly with no problems, even if you require an extensive vendor information form. Set up your assignment with me and it will get done without any worry from you. Let’s team up to make your project a success.